Pope Francis made history this morning when he celebrated Mass for more than 135,000 Catholics from many nations and cultures at the Zayed Sports stadium in Abu Dhabi in the United Arab Emirates. It was the largest Christian act of worship ever celebrated on the Arabian Peninsula, in the heartland of the Muslim world, and the festive occasion gave powerful expression to the joy of the Gospel. Almost everyone had a small yellow and white Vatican flag, which they waved energetically. 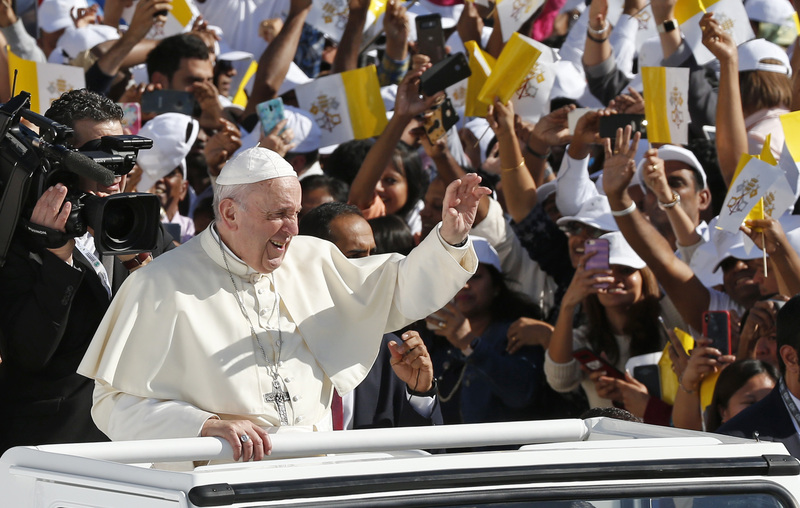 There were scenes of joy and excitement as Pope Francis was driven in a jeep around the stadium before Mass to greet these Catholics, migrant workers from India, the Philippines, Uganda and many other countries of Asia and Africa, as well as expatriates from Western countries. They cheered, sang, chanted and applauded enthusiastically as they waited for the pope to arrive. Francis also appears to be greatly admired in the Muslim world and especially here in the United Arab Emirates. The country’s minister for tolerance and other authorities of the U.A.E. attended the celebration together with 4,000 Muslims. The presence of the minister and so many Muslims at the Mass sent a powerful message of tolerance to the inhabitants of this peninsula and to Muslims and Christians across the world. It was also a strong repudiation of some who seek to ignite the clash of civilizations and foment hostility between Christians and Muslims for political ends. All this followed on the breaking news last evening that the crown prince has given the gift of land for the building of a church and a mosque side by side in memory of these historic days, and Pope Francis and the grand imam of Al-Azhar blessed in their respective ways the foundation stones of the church and the mosque, something that would have been unthinkable hitherto. In his homily from the light and modern podium at which he celebrated the Mass, under the blazing sun, Pope Francis, himself the son of Italian migrants in Argentina, expressed his love for his “migrant flock.” The Catholic Church believes there are some one million Catholics in the U.A.E. Most are Filipino and Indian, many of whom have left behind families for work and can face precarious labor conditions, which human rights groups regularly denounce. It was the largest Christian act of worship ever celebrated on the Arabian Peninsula. He added, “People say that the difference between the written Gospel and the lived Gospel is the same difference between written music and performed music. On this historic occasion that put on display the catholicity of the migrant church, Pope Francis concelebrated Mass not only with the apostolic vicar for the southern Arabian Peninsula, Bishop Paul Hinder, but also with church leaders from other countries, including Cardinals Pietro Parolin and Leonardo Sandri from the Vatican; Cardinals Joseph Coutts from Pakistan and Bechara Boutros Rai from the Lebanon; Archbishop Pierbattista Piazaballa from the Latin Patriarchate of Jerusalem; and the priests, most of them Franciscans, who serve it. He celebrated the Mass “for peace and justice” in English and Latin. The Scripture readings were done in Arabic and English, and prayers were said in Korean, Konkano (India), Tagalog, Urdu, Malayalam and French. Pope Francis delivered his homily in Italian, and it was translated into English and Arabic. Recognizing the reality of the lives of these migrant believers, Francis said: “It is most certainly not easy for you to live far from home, missing the affection of your loved ones and perhaps also feeling uncertainty about the future. But the Lord is faithful and does not abandon his people. Bishop Hinder concluded by asking Pope Francis “at the end of a historic moment” to give them his blessing, wishing him “a safe trip back to Rome,” drawing tremendous applause from the faithful. Pope Francis embraced him and then blessed these believers to whom he had brought immense joy by his visit. After Mass, Francis drove to the Abu Dhabi international airport to return to Rome, at the end of a visit in which this missionary pope not only wrote a new, positive and very important page in the history of Christian-Muslim relations but also in the history of church. The gift of land is a generous offer and hopefully, a sign of rapprochement between Christianity and Islam in the region. Pray for peace. God bless UAE, the land and its people with peace and unity. This article also appeared in print, under the headline "GoodNews: Pope Francis leads largest-ever Christian act of worship on the Arabian Peninsula," in the March 4, 2019 issue.